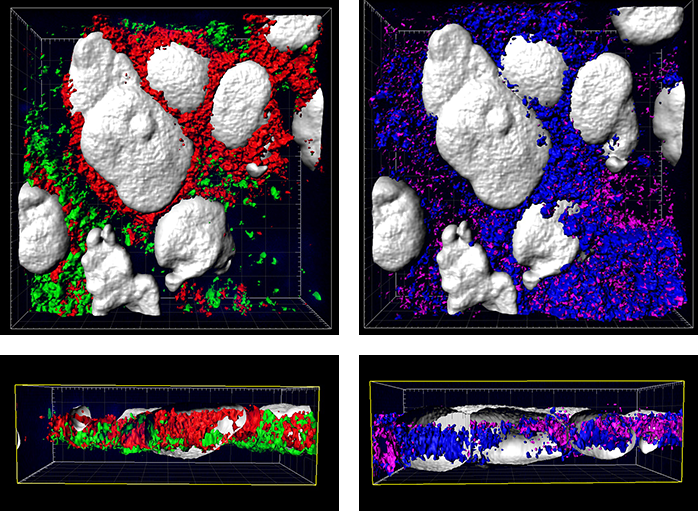 Imaris software helped researchers led by Dr. Vladimir Liarski of the University of Chicago study interactions among immune system cells in human tissue. This work is helping to reveal more about the role that specific immune cells play in human inflammation. The researchers used the Imaris Clipping Plane to view the interfaces of membranes and to observe membranes in two different planes. Here, CD3 (T-cell projections) is red, ICOS is green (T follicular helper cell nuclei), CD20 (B-cell nuclei) is purple, and major histocompatibility complex is blue. Image courtesy of Dr. Vladimir Liarski, University of Chicago. An important part of adaptive immunity is the direct recognition of antigen by T cells and antigen-presenting cells through cell-to-cell contact, or cognate interactions. In mice, electron microscopy studies have shown that T follicular helper cells are critical for helping B cells fight infection, but it isn’t known if the same is true in humans. To find out, Dr. Liarski’s research team studied inflammation in human lupus nephritis, a kidney complication of lupus - an autoimmune disease. The researchers initially used multichannel confocal microscopy to image immunofluorescently stained tissue. These images showed overlapping CD20 positive B-cells as well as CD4 and ICOS double-positive T-cells, which suggested very close membrane process opposition and interdigitation. The researchers used a laser scanning confocal microscope to acquire z-axis images in 0.25-micron increments. 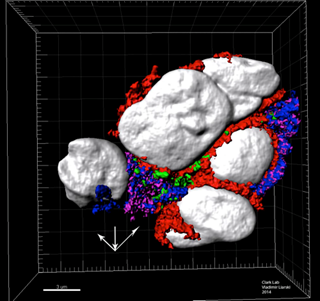 They then created three-dimensional computerized reconstructions of antibody stains using the Imaris Surface Creation Wizard after manual threshold optimizations. To observe cross sections of cellular interfaces, they selected an axis perpendicular to a given cell with the Imaris Clipping Plane tool. “The use of cut planes was very important in confirming the interdigitating nature of the membranes of opposing cells to see peripheral- and central-supramolecular activation complex-like structures, expected in the setting of cognate interactions,” says Dr. Liarski. He adds that Imaris was beneficial to this study because it provided automated object detection and exclusion of background artifacts based on particle size, computer rendering of 3D objects, the ability to manually set thresholds independently for each channel, and the use of cut planes for the rendered models as well as input stains. Overall, the study demonstrated the presence of T follicular helper cells in the context of human lupus nephritis interstitial inflammation. Dr. Liarski explains that, within the biopsies examined, these T cells were not just close to most of B cells with peripheral- and central-supramolecular activation complex-like structure formation, but were also functionally activated based on elevated bcl-6 and interleukin-21 levels, suggesting that they were actively participating in cognate interactions. This implies that T follicular helper cells are important for the pathogenesis of lupus nephritis and may represent a potential therapeutic target in future studies. The researchers are now pursuing multiple techniques, including using Imaris, to analyze interactions between T cells and dendritic cells and to distinguish cognate- from non-cognate processes in this context. The additional images were created by the Bitplane team based on the original image data curtesy of Dr Liarski. Imaris 3D Surface segmentation in combination with 2D Orthogonal Slicer illustrating spatial relationships within human lupus nephritis. The silver surfaces identify cell nuclei stained with (DAPI), while the red represent CD3, green LFA1, magenta ICAM1 and blue MHC class II. Research paper: Liarski VM, Kaverina N, Chang A, Brandt D, Yanez D, Talasnik L, Carlesso G, Herbst R, Utset TO, Labno C, Peng Y, Jiang Y, Giger ML, Clark MR. 2014. Cell distance mapping identifies functional T follicular helper cells in inflamed human renal tissue. Sci Transl Med 6(230):230ra46.